It had been a while since I had spent some quality time with my three youngest nieces & my middle sister & I was really starting to have withdrawals from them. You see before I got very sick & had to go into full time care I used to nanny for my sister, this was years ago when the youngest was a new born & she is now going on ten so as you can well imagine we are talking along time ago. Anyway, as my body started to give way on me & I became less able to take care of myself let alone three little girls I had to humble myself & admit I was no longer in a position to mind them & my poor sister had to go outside the family & look for a nanny through an agency. She has done this ever since & it has had its ups & downs but all in all it has seemed to work out! The downside of it all is that I don’t get to see my little cherubs nearly as much as I would like to so when I get the opportunity believe me I savour every moment! It was last Sunday & my sister suggested I come over & they put me in the wheelchair & they take me for a walk around the area – this sounded like a great idea to me! Anyway, Mum & Dad picked me up from the establishment & we took our usual route (especially when my Dad’s driving) we drove past our favourite coffee bar & bought three cappuccinos & one flat white! Yummy I thought to myself, no matter how hard they try at the establishment their tea & coffee can never quite match up to a takeaway cappacino from the local coffee bar. Off we went to my sisters & it was nice because Mum & Dad were coming in to join us for the coffee drinking ceremony! There was a feeling in the air that made me wonder whether or not we were going to actually make it to the walk in the wheelchair but I didn’t care one little bit as long as I was with my girls I was perfectly happy! When family is just enough……. So the process began…..she disappeared for a good five minutes & then she appears with her very own makeup kit! Never in my life have I seen anything like it, she has every brush for every part of the face, different shades of powders, eye shadow, blushes, special eye pencils that have very special jobs apparently & of course the absolutely necessary mascara! Right, paper towell was laid down on the stool incase of any accidental spills, everything was lined up & the show was ready to begin! I sat there like a princess being absolutely pampered & I would ask her the occasional question as to what was happening & she was able to tell me exactly what she was doing & why she was doing it…….a bit of blending of the powder to make sure there was no lines on the neck, of course the eye pencil which if I could remember its job I would be able to tell you but she certainly knew it’s purpose & then lastly I had to rapidly blink my eyelashes for what seemed like an absolute age so that the mascara went on just right! “Well, Aunty Jen Jen I think we’re finished & you look beautiful, doesn’t she?” the question aimed at her almost fourteen year old sister who had shown a distinct lack of interest throughout the whole “process” other than to make the occasional comment on the heaviness of the powder or perhaps the mascara might be a bit thick, to which she got the usual sister to sister reply “shut up & mind your own business I’m the one doing Jen Jen’s make up”. The fourteen year old was now allowed to speak as she had been asked to give her opinion & she thought it looked great, possibly a little thick & dark in places but other than than that apparently I looked beautiful. Well, there was a smile from ear to ear & one very proud nine year old, she was very impressed with her handiwork! So, now it was time for photos, sensible ones & then of course a couple of silly ones. I will put in a few with this post so you get to enjoy some of fun that we all had! 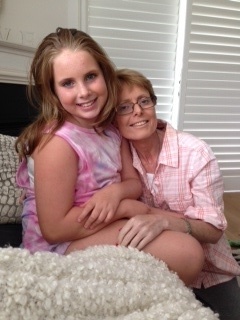 I truly hope you as the reader have times when “family is just enough……” – it is most refreshing!! 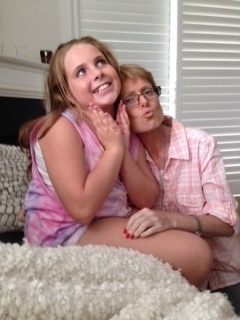 The make up artist with Aunty Jen Jen being silly! 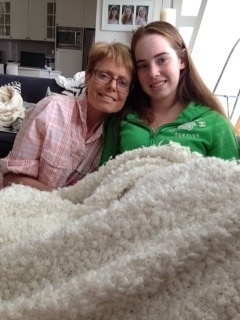 The made up one with the fourteen year old! I don’t know about you but I just love this time of the year. 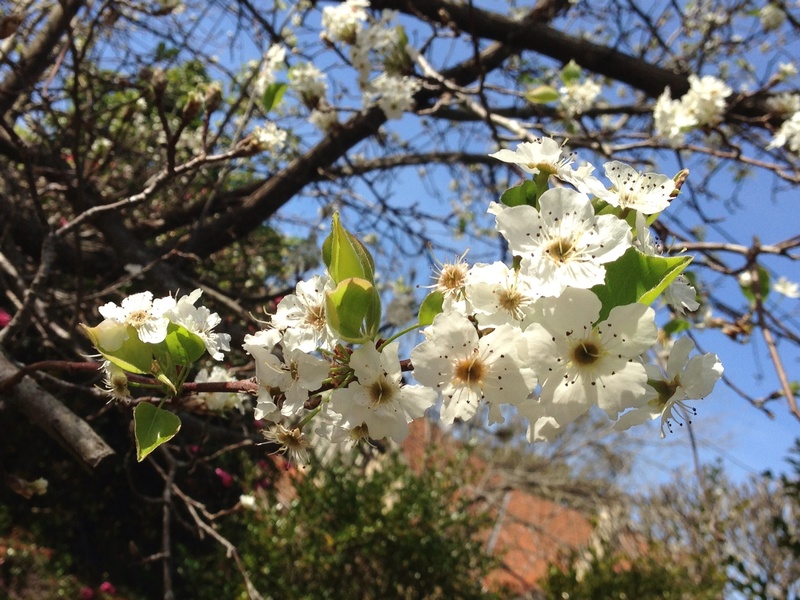 The trees are magnificent, the bushes are bulging with flowers showing off the most amazing & breathtaking colours, but the trees that get me that make me smile with absolute joy whenever I see them are the blossom trees. I am not sure of all their individual names, but what I do know is they are something to die for as you watch them bloom. Where I live, the street at the top of ‘the establishment ‘ has got a row of blossom trees & each time we are brought back from an activity on the bus or I come back with one of my friends or family I have the sheer delight of watching them change, the blossoms have come out more & I always comment out loud ‘hey everybody take a look at those magnificent blossom trees’ (I’m sure I’m starting to sound like a cracked record but I just can’t help it, they are just so beautiful!). I will include a photo below of the row of them in the street so you can get some idea of what I’m talking about, but I’m still not convinced the iPhoto comes close to doing it any justice, but its worth a go. There is also a beautiful rosé garden down the bottom of ‘the establishment’ that Tash the therapy dog & I often go for nice walks. I have been watching the rosé bushes start to develop since they have been pruned right back, but they are not at the flowering stage yet, I can’t wait until they are so I can take some photos & show them off to you all. What is down there that has caught my eye over the last few days is a little baby blossom tree & it is producing the most unbelievable buds & I couldn’t keep on walking past without capturing another picture. 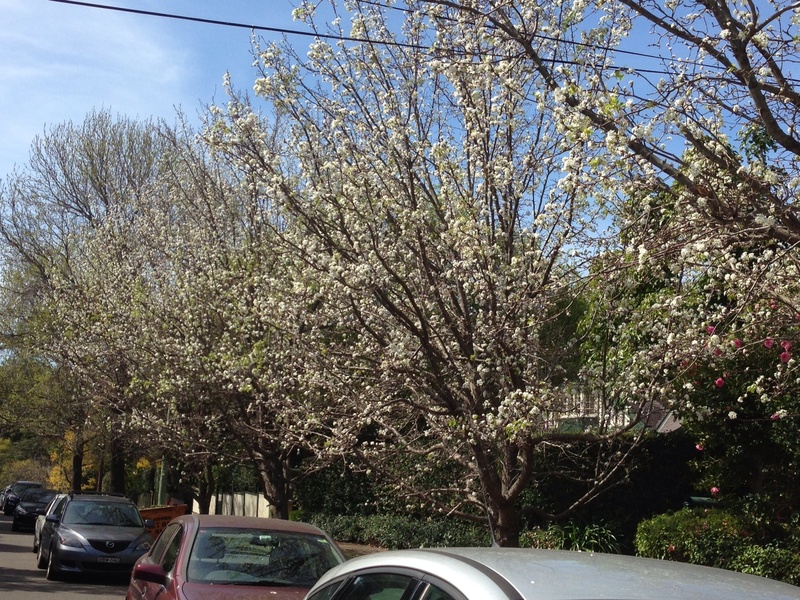 I just smile each time I walk past & am reminded once again that even though there is so much hardship & battles in life we have been surrounded by little reminders like blossom trees & different seasons that bring us so much pleasure. Sometimes, we need a little jolt every now & again to remind us of these little pleasures but I’m sure once reminded it doesn’t take long for that face to light up again! 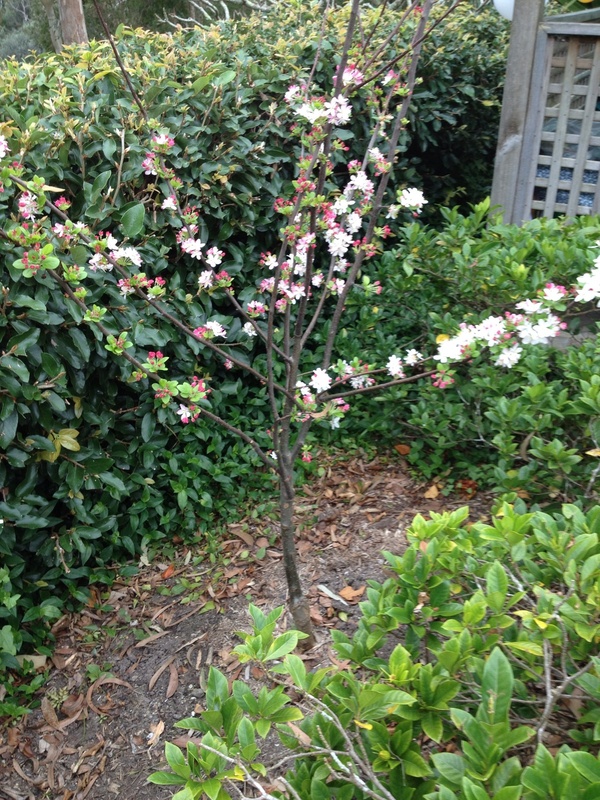 Thank God Spring has sprung!!! Row of trees in street! Just what every girl needs…..a PEDICURE & A MANICURE! I don’t know whether your feet have ever got to the stage where you’d be ashamed to have an elephant see them????? Well, believe more mine had certainly reached that stage, being winter & all, you become less self conscious of what your toes look like because all your shoes are closed in so really, who cares????? Me!!! I HATE crusty feet, especially being in the establishment & having people help me with my shower every day, I can’t exactly hide them away! I have been dying to get out & have a pedicure but its not that easy these days. Firstly, I can’t just wander up the street & book myself into the local Vietnamese pedicure production line place, ‘the establishment’ is not so keen for me to go on little self initiated outings by myself……..can’t think why, I think I’m quite steady with my four wheeled frame, as long as I don’t come across any bumps in the pavement😉.Secondly, my finances these days don’t allow for too much self indulgence & I would certainly consider a pedicure indulging oneself! But, what you need to know about me is that I have the most amazing friends who spoil me rotten & this was one of those occasions. I thought we were going to get our crusty feet made fresh & brand new but as it turned out she had also booked us in for a manicure. I couldn’t believe my ears when the lady announced “two for manicure & pedicure”, I turned around & said to my friend “are we having a manicure as well” & her response was”of course, we can’t have one without the other! !” Oh, my goodness I thought I was about to die & go to heaven…..not only was I out of ‘the establishment’ but I was going to be pampered for the next 90 minutes & pampered I was! We were spoilt with hot wax on both our feet & hands which once removed made them feel so soft & not crusty. 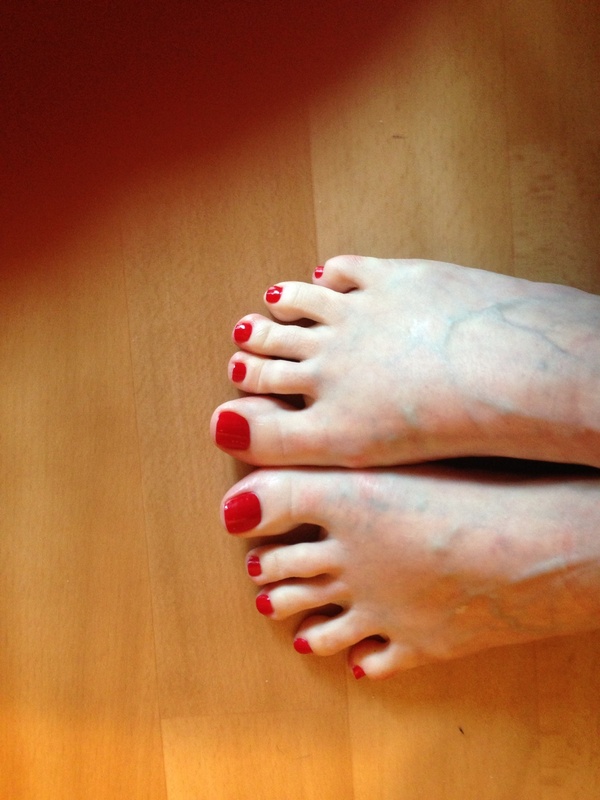 My feet were massaged, my calves were massaged & then the final part, painting my now soft & moist toes with my favourite toe nail colour – bright red! I had to take a photo & ill put it at the bottom of the post! I truly must say that even though I’m living with oldies & the establishment can sometimetimes be a little trying I am one of the luckiest girls around. I have so many wonderful friends who genuinely care for me & are so kind to me!!! All I can say is I am one BLESSED girl & thanks a million Kym I had the best time ever! A day to remember!! A trip out for FROZEN YOGURT!!!!!!!!! Today my sister & two of my beautiful nieces are coming to pick me up from the “establishment” (what we will affectionately call it from here on in!) 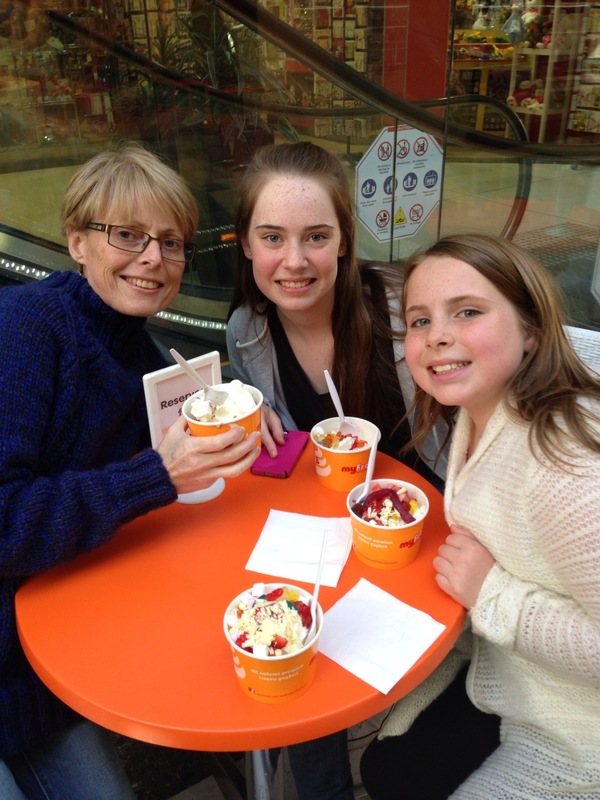 & are taking me out to the local mall for a bit of a wander around then we are going to have my most favourite food in the world…….FROZEN YOGURT! Now, as we are still very much in the early days and getting to know each other you understandably don’t know much of my somewhat difficult health situation. One of the battles I have is that I am fed by what they call a PEJ feed which in simple English just means I have a tube in my tummy that goes all the way through to my Bowell and it runs for close to twelve hours a day. The downside of all this is that due to this disease I’m battling I can only have puréed food, so frozen yogurt for me is a treat beyond belief. I am so excited about my day I have just looked at my watch & I need to go & get ready, so I I’ll post this now but make sure I work out how to attach photos after I get back from my adventure! !